Where technologies like mobile edge computing (MEC) or network slicing are needed to deliver on 5G promises, data analytics is a space that looks to benefit from 5G’s ability to support data collection and distributed processing. At the same time, as 5G brings new complexity to network rollout and operations, data analytics and automation will be critical for simply getting 5G up and running. In taking a look at MEC, NB-IoT and network slicing, our last three posts on 5G ecosystem components focused on network technologies and innovations required to make 5G a reality. It isn’t the case, however, that supporting 5G network builds and benefitting from 5G are mutually exclusive – consider the role of data analytics and artificial intelligence (AI). To position “big data” as a broad topic is something of an understatement. Telcos tend to look at it from analytics on user data (improving service offers), network data (improving network operations) and the massive amounts of sensor-based and other IoT data likely to run over their networks. From a multi-industry perspective, there are myriad data sources to be collected and analyzed in support of myriad benefits. Before starting on the role of analytics in 5G, then, it’s worth framing the conversation with a description of analytics. Getting to the point where we can use these capabilities will, of course, require no shortage of human intervention in terms of prioritizing investment and innovation. And how does this all link to 5G? Enhanced Mobile Broadband. Rather than just delivering massive bandwidth, Enhanced Mobile Broadband is about delivering enhanced experiences. Data analytics come into play for identifying the bandwidth required to deliver that experience, based on application or user profiles. Massive IoT. A fundamental difference between IoT and machine-to-machine (M2M) use cases is the role of data; where M2M is about connecting and transactions between things, IoT is about connectivity in the name of control and/or capturing data in order to analyze things and take action. Here, 5G’s ability to support massive connectivity across diverse devices – backed by the distributed compute architectures – creates the ability to gain insights from data in real-time. Critical Communications. Critical use cases will generate data. More importantly, the requirements on when and where that analysis takes place will be constrained by bandwidth, and processing power, not to mention available network resources. Whether thanks to slicing-based traffic prioritization, MEC-based local analytics or the latency improvements promised by a new 5G air interface, 5G lays a foundation for supporting critical analytics. It makes possible the real-time and automated intelligence that can seamlessly travel from the cloud to a plethora of end points. Putting this into context, think back to this year’s Los Angeles Auto Show. You might not have expected Intel’s CEO to show up, but he did, noting, “if you have rich data, your car will be able to deal with complex route situations. If not, the car will stop.” Or, more succinctly, “data is the new oil.” This explains some of Intel’s recent moves (including the Nervana acquisition and platform launch). 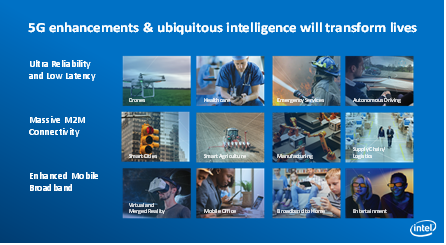 The same trend can be seen in a number of industries linked to 5G use cases, from public safety and precision agriculture, to smart cities-based efficiencies and prescriptive healthcare services tailoring based on user data. In an effort to support these use cases, the role of data analytics is elevated with 5G. While 4G was often positioned as a “data” network, this was only within the context of circuit switched connectivity giving way to IP connectivity, even for applications like voice. 5G, on the other hand, is positioned as an intelligent network that supports data and analytics use cases, helping it reach out to drive new industries in a way that wasn’t possible previously. Ultimately, however, there is a dual role for data analytics within the context of 5G; along with supporting new business opportunities, analytics will also be key to getting 5G networks rolled out and operational. Between multiple layers of virtual functions, virtual and physical RAN assets, and distributed computing nodes, 5G networks will be fundamentally complex beasts. Add in diverse 5G RAN considerations – densification-driven RAN node proliferation, mmWave spectrum usage, unlicensed spectrum usage, shared spectrum usage – and the complexity of 5G networks cannot be overstated. Network data, then, will be key for managing this complexity in the name of network rollout and operations. Think where to deploy capacity. Think how to balance capacity and coverage. Think how and when and where to scale specific network functions, or application microservices. Think network utilization information supporting AI-driven proactive care. In a simple network with limited capabilities, data analytics is of marginal importance: the network can only carry so much data and there’s not that much network data to collect or act on. 5G networks look to be anything but limited or simple, making analytics key to delivering on the 5G promise and making the full use of 5G resources. Previous postVirtual VoLTE: A ‘Marriage Made in Heaven’ or a ‘Double Whammy’?